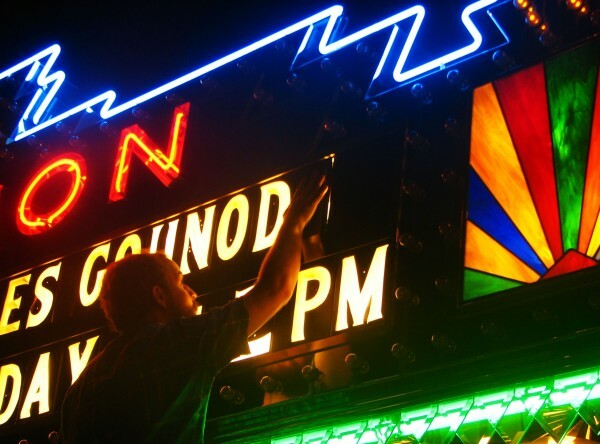 Criterion Theater House Manager Benjamin Smith changes lettering on the Bar Harbor theater's new marquee last summer. BAR HARBOR, Maine — Officials with the Criterion Theater and Arts Center are preparing for their final curtain call. The nonprofit group has been struggling to stay financially afloat and, unless a miracle comes along, they expect they will have to close the theater by the end of June, theater officials said this week. June 30 is next Thursday. The group issued a statement on Friday saying it simply has run out of money. “With several rental payments looming, much debt, and no operating budget left, [the theater] will be forced to close operations at the end of June,” the statement indicated. The group was founded in May 2007 when Erin Early-Ward and her then-husband Anthony Uliano bought the theater from restaurateur Michael Boland for $1.4 million. The plan at the time was for the nonprofit group to eventually purchase the building from its landlords. But the group’s financial problems became apparent in late 2009 when it was fined for not getting municipal approval for certain design elements that were added to the theater’s refurbished marquee. Criterion officials said they could not afford the town’s $4,000 fine because the cost of refurbishing the marquee — reported to be $150,000 — drained its pool of available funds. An anonymous donor later gave the theater the money to pay the fine. The next July, the group faced possible eviction by Early-Ward, who by then was the sole owner of the building, but was able to reach a last-minute agreement with the landlord. The next month, the theater’s staff closed the Criterion doors and walked out, according to the then-manager, because of money woes and a lack of communication between him and the board. The group reopened the theater last fall with a new manager, refocused its attention on fundraising and programming, and this past March released a new business and restructuring plan. But the renewed sense of purpose has not translated into fundraising success, board member Rob Jordan said Friday. The group has been busy booking live shows and providing a performance venue for other nonprofit organizations and arts groups, but the money just has not materialized. Jordan said that because of its financial obligations, the group has been unable to spend money on marketing to promote events, which has affected attendance. It has had plenty of volunteers, he said, but cannot even afford to hire a development officer to help raise money. Even if it did, the sagging economy has made financial donations more scarce, he said. Jordan said the board plans to meet Tuesday with Early-Ward to discuss the situation, but it doesn’t expect any more last-minute reprieves or donations to materialize.